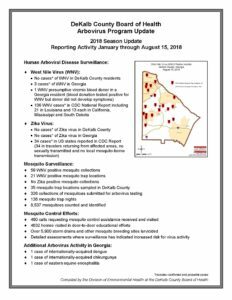 To reduce the spread of West Nile virus (WNV) and other mosquito-borne diseases, the DeKalb County Board of Health provides an integrated mosquito control program. This program works with residents to reduce mosquito infestations. 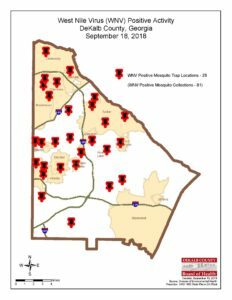 Together with other county and state agencies throughout the metro Atlanta area, the Board of Health is working to track the mosquito population; to find, control and eliminate mosquito-breeding sites, and to educate the public in mosquito control. Individuals can help protect themselves, their homes and their communities in a number of ways. Eliminating mosquito breeding sites is an important first step. For assistance in identifying breeding sites and to report mosquito infestations, request a mosquito assessment with the link to the left or call 404-508-7900. 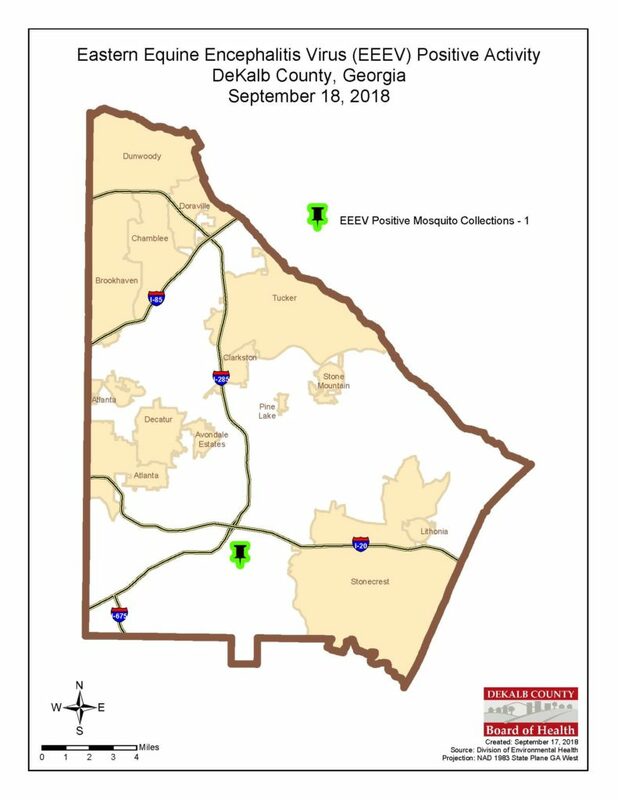 On September 18, 2018, the DeKalb County Board of Health announced that the Eastern equine encephalitis (EEE) virus was detected in a mosquito collection in the county. It is the first time this virus has been found in mosquitoes in the northern section of Georgia. The EEE virus is commonly associated with coastal plains. The EEE virus is transmitted through the bite of an infected mosquito. EEE is a bird disease that is occasionally found in horses and humans. Though it is a rare illness in humans, EEE is one of the most severe mosquito-borne diseases in the U.S.
For more information about EEE, click here. To read the Board of Health’s Sept. 18 press release, click here. TO REPORT A PUBLIC HEALTH EMERGENCY, CALL 404-294-3700, 24 HOURS A DAY, 7 DAYS A WEEK.